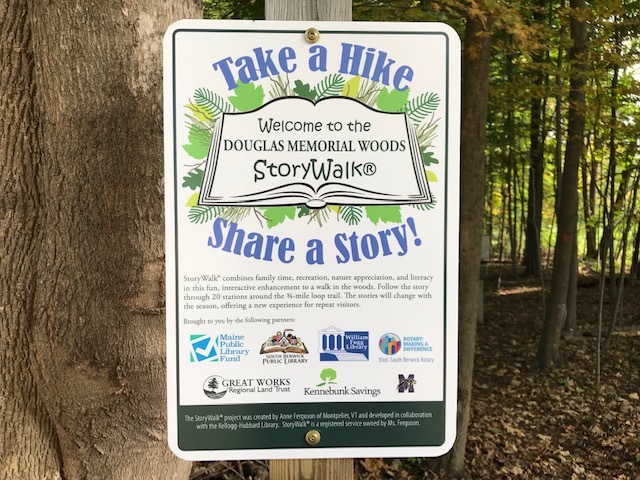 Rotarians and librarians welcomed visitors to the newly-opened Story Walk at Douglas Woods in Eliot, Maine. Thanks to grants and support of the Great Works Regional Land Trust, the Kennebunk Savings Bank, The Marshwood Hawks, and the William Fogg Library, the Maine Public Library Fund and the South Berwick - Eliot Rotary Club, families can walk the Douglas Woods while reading a story book page-by-page on well-placed pedestals built by volunteers of the Great Works Regional Land Trust as they hike the 3/4-mile path. What a great way to enjoy the outdoors, instill literacy, and bring families together! Stories along the walk will change from season to season.